Disclosure: AD – We were gifted tickets to Roarr! Dinosaur Adventure in return for an honest review. As always, we only recommend places and things we really love, and all our opinions are our own! Both of our children absolutely LOVE dinosaurs – in fact I swear that in our house we own every dinosaur known to man (and some made up ones definitely unknown to man!). So when we were asked if we’d like to visit Roarr! 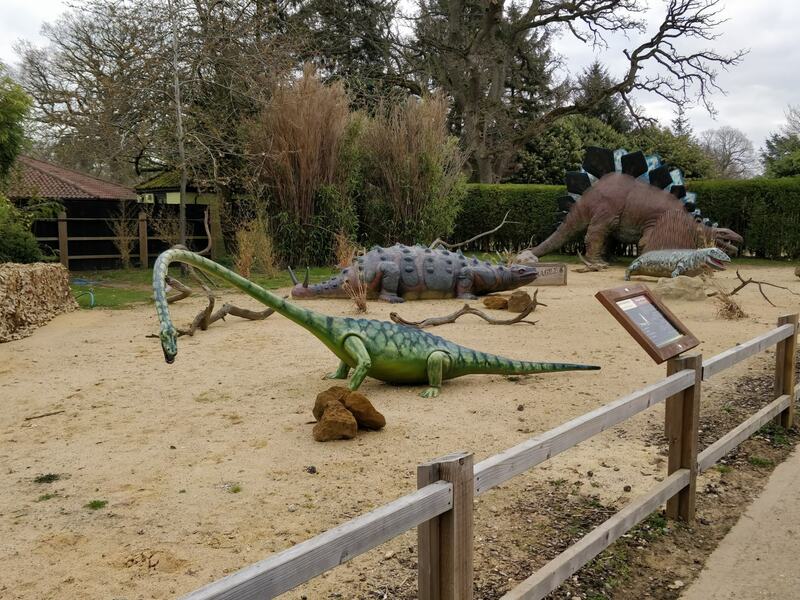 Dinosaur Adventure in Norfolk, the kids could barely contain their excitement! This was an absolute dream visit for them, and I couldn’t wait to see what fun we’d get up to. Of course, being a Newby, he couldn’t just go for the bog standard stegosaurus could he? Nope, he had to go for a red one! The coolest part for him was realising that when he stuck his tongue out, it look as though the stegosaurus was sticking it’s tongue out! Cue hours and hours of him doing this to every single mirror he could find! We were genuinely amazed and delighted by Roarr! Dinosaur Adventure. I think we were expecting something similar to a theme park with queues of people for rides, but there was nothing of the sort. It was so much more gentle and much more simple fun, which was utterly perfect for us. 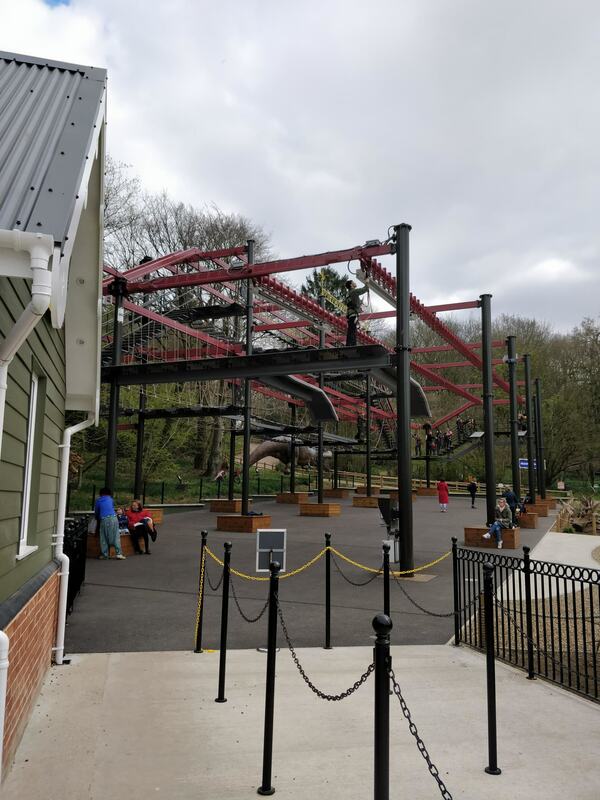 We expected there to be hoards of people as it was in the Easter holiday, but because the park is laid out in such a great fashion and over such a large space, we never felt crowded once during the whole day. We decided that we would use the map and work our way round the whole park – which turns out was a great thing to do as it meant that we didn’t miss anything. 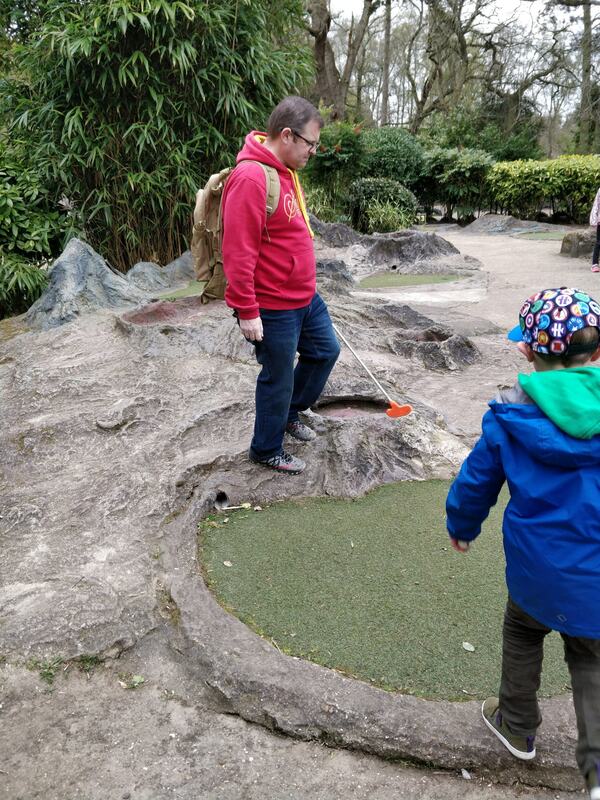 We spent about 20 minutes giggling our way around the crazy golf (turns out I’m a really big cheat – who knew?? ), and the kids had a fab time both on the go karts and the StoneAge Racers. There was a really small queue for both of these, but no longer than about 5 minutes which was perfect. Then came what we hoped would be the highlight of the day – the high ropes! For the first time ever, Alex was actually tall enough to go on them (albeit with an adult) and he was so excited. We did end up having to wait here for about 45 minutes as it takes quite a long time to get everyone into harnesses and they only allow 10 to go at a time (which makes perfect sense otherwise it would be carnage up in there.) But we were happy to wait, watching the safety video and being super excited. It was all going so well. Until we actually made it over the first bridge. Paul and Estelle headed off together to the upper levels as she climbs like a monkey and absolutely loves high ropes, and Alex and I decided to play it a bit safer and stay on the first level. Unfortunately it turns out that Alex really REALLY doesn’t do heights! He started to go across the second bridge and froze with fright. Thankfully I managed to get him back and after a second aborted attempt, we made the very sensible decision to head back down and go and get some food to calm us down. 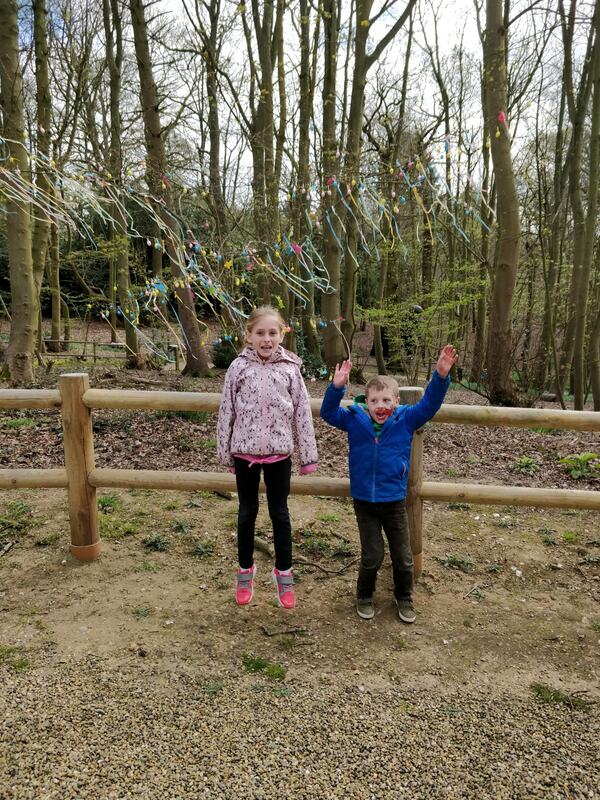 However, Estelle said that it was utterly brilliant and she loved the zip line at the end – as Alex said, at least he tried and maybe next time he’ll be a bit older and a bit braver! Roarr! Dinosaur Adventure was also getting into the Easter spirit. There were these beautifully decorated Easter trees dotted around the park, and there was an Alice In Wonderland Easter theme going on. We spotted The Queen Of Hearts wandering around quite a lot, and she very loudly announced to the world that we’d just been to the toilet when she spotted us leaving the toilets before lunch – which made the kids, and other adults in the vicinity, fall about laughing. 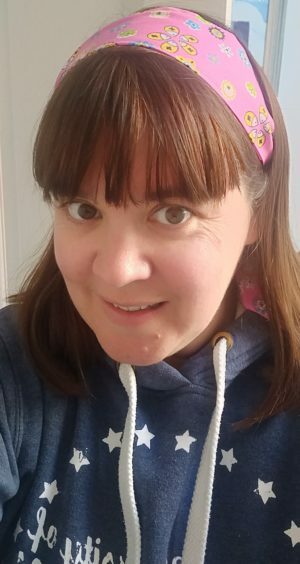 There was an Easter hunt where you had to find the eggs in different places and were awarded with a fabulous medal at the end of it – which was a lovely touch! We also had chance to check out some of the other areas that Roarr! Dinosaur Adventure has got to offer that we didn’t manage to use this visit. This splash park looked absolutely epic, and we really wished it had been warm enough to get splashing. Saying that, there were a number of people who had decided that they’d go for a splash regardless of the weather and it did look like great fun. I can imagine that when the weather warms up, this will be THE place to go in the park. 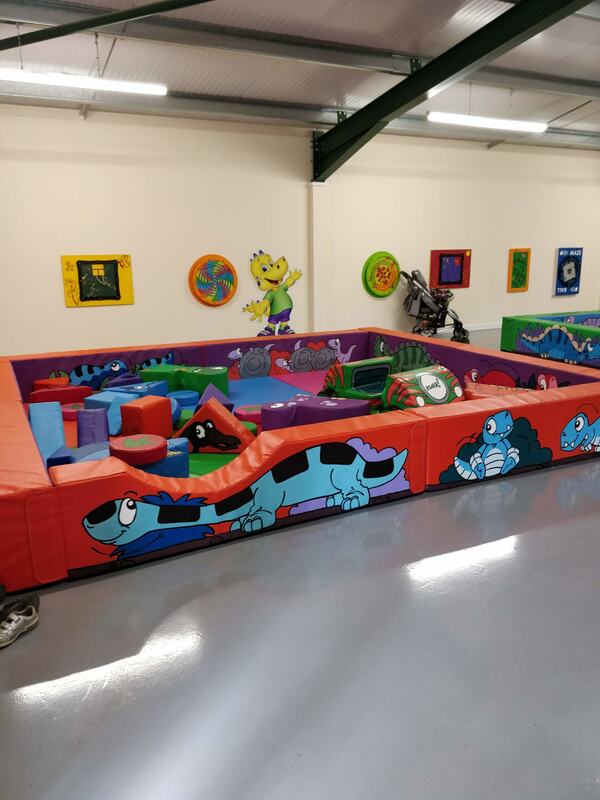 We also popped our heads into the new Dippy-Ville area which is a soft play area designed for the smaller visitors. It looked really good fun and I know my kids would have loved it if they were smaller! Of course, being 6 and 8, they couldn’t resist heading down any slide and climbing any piece of equipment they came across – and there were lots to choose from. 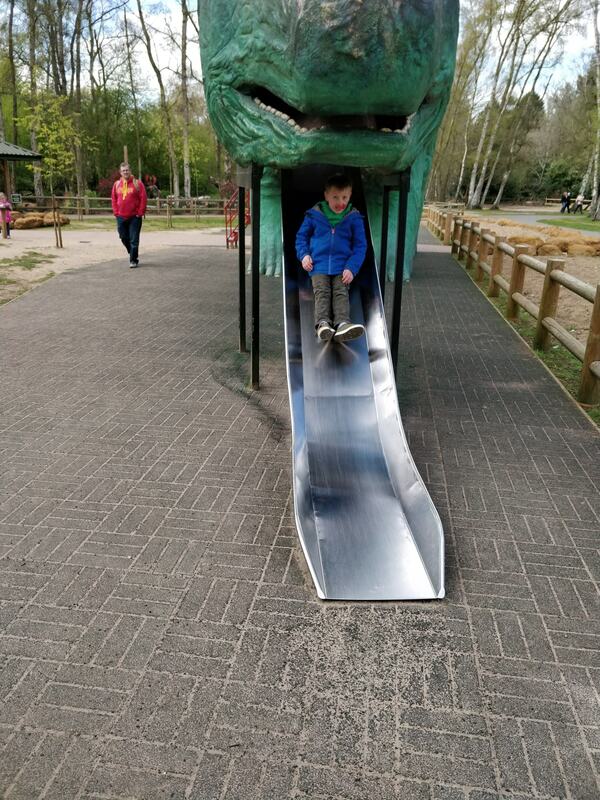 Alex absolutely loved clambering up inside this huge dinosaur and sliding out of it’s mouth. You could even choose to slide from it’s bottom if you so wished, which the kids thought was the funniest thing ever. We normally take a picnic with us on days out, but we decided that this time we’d give the restaurants a go and see how we fared. We could have chosen to have what looked like delicious fish and chips seated outside, but it was so cold that we made the decision to eat inside the Navigator restaurant and I was delighted we did. 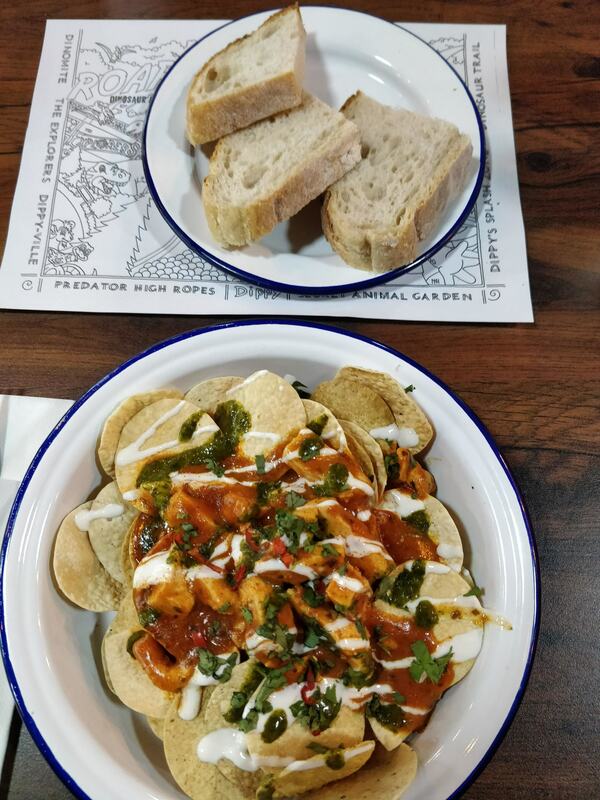 I can be quite picky with choosing food as I always like to try something a little different, so when I spotted this dish of chicken tikka on poppadoms with chilli sauce, I was in heaven. It was utterly delicious. Considering parks can be really expensive, we had chicken nuggets and chips for the kids, fish and chips for Paul, and my chicken tikka, plus 4 drinks for under £30 which we thought was pretty good going! Once we’d finished eating then we just had time for a few more activities. So obviously, being a dinosaur park, we had to have a go at being palaeontologists. 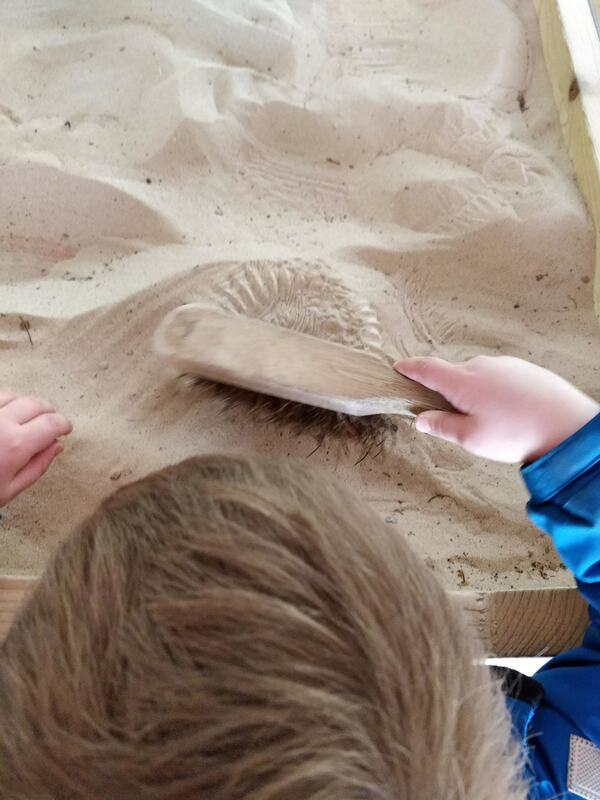 It was such a great set up – huge sand pits with plenty of brushes, all under cover, and pictorial diagrams explaining what you are looking for and what dinosaur they came from. The kids were in their element, but it was Paul that I had to drag away in order to give us time on the Deer Safari. I think this was the part that surprised me the most. I had thought it would all be about dinosaurs, but actually Roarr! 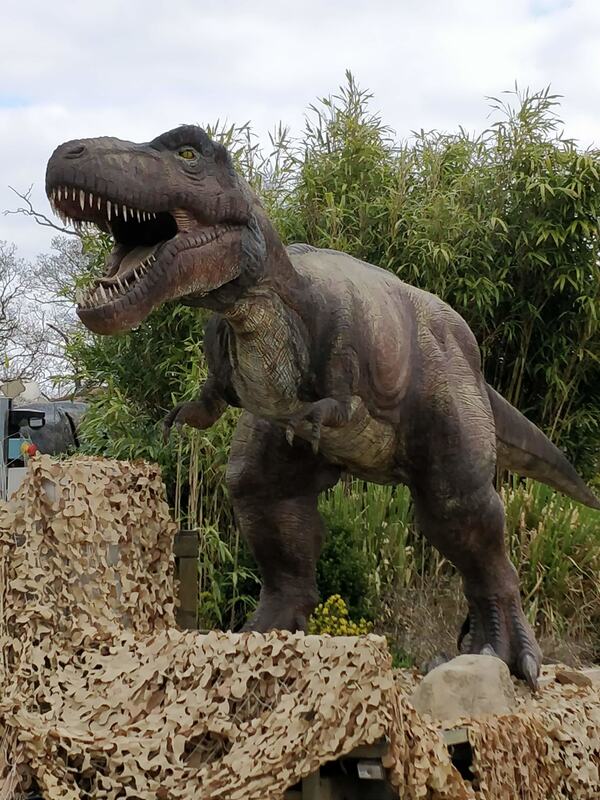 Dinosaur Adventure has lots of animals to see, including donkeys, some utterly hilarious chickens and a small farm. 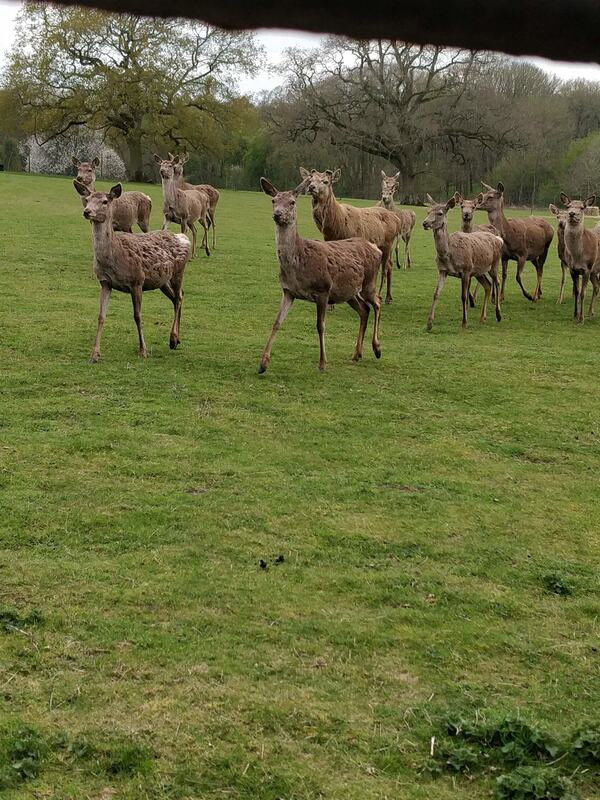 But the part we loved the most was the Deer Safari. You did have to pay a little more to go on it (£2 each), but it was absolutely worth it. It took about 30 minutes from when we got on board the truck to when we got back, and we had a guide with us explaining about the deer we were seeing and telling us more about them. She was so good with the kids, and spent loads of time answering all their questions and finding out what they knew. It really was great fun. All in all we had such a great time at Roarr! 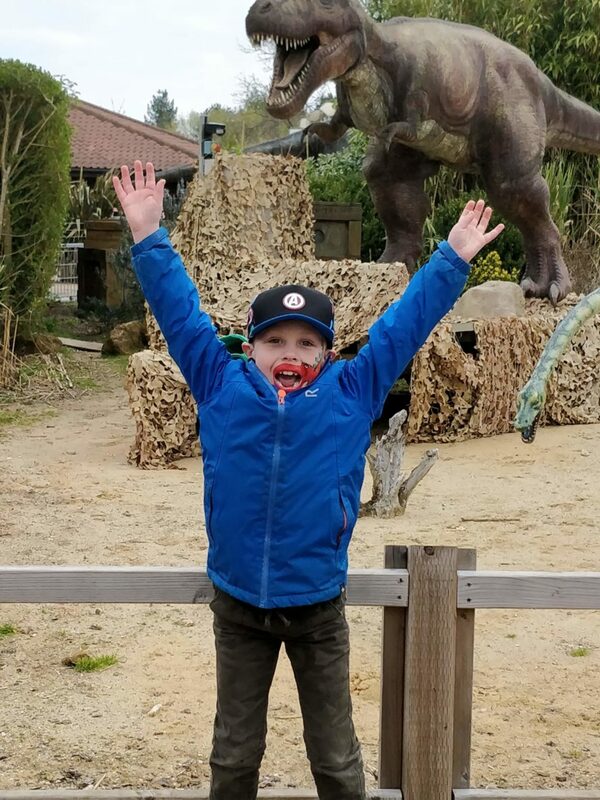 Dinosaur Adventure, and I think it’s become our new favourite place to visit. 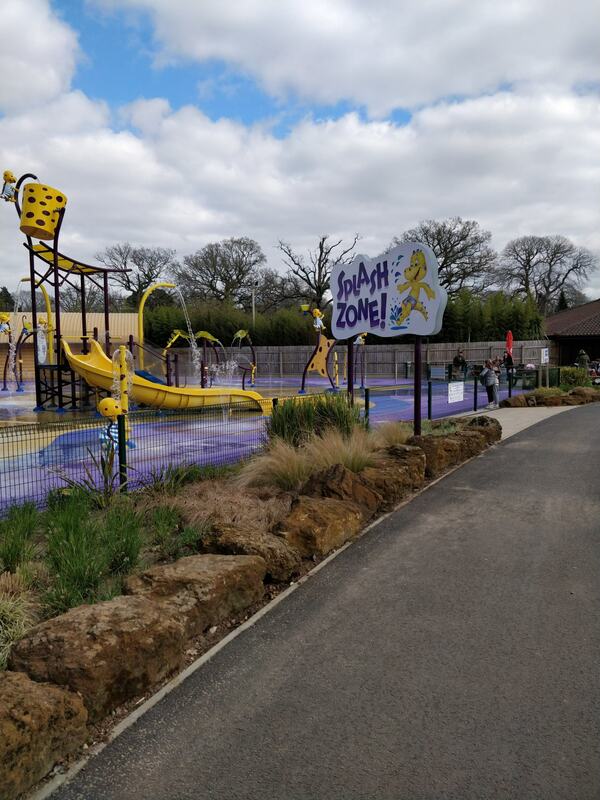 The Easter activities are taking place throughout the Easter holidays, and all the areas, including the splash park, are now open to visit. 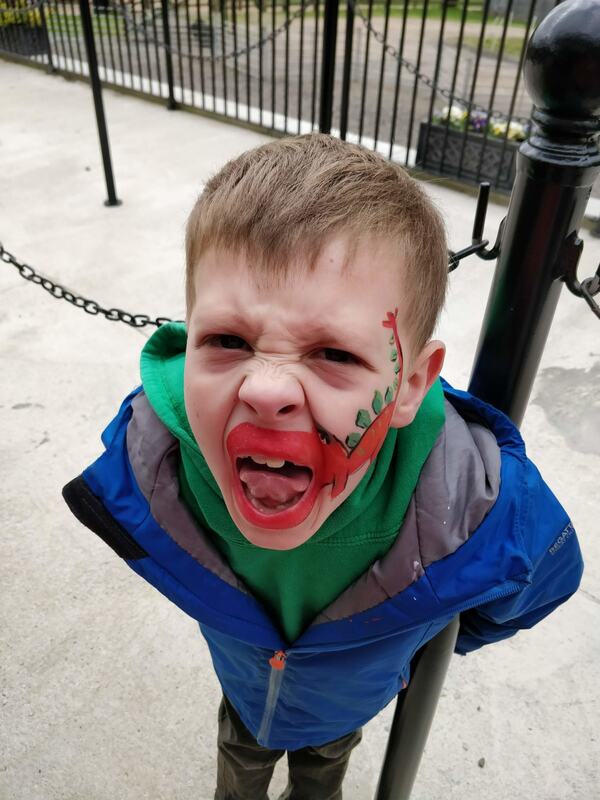 If you are looking for a fun day out, with a huge variety of things to see and activities to do, then definitely check out Roarr! Dinosaur Adventure.